A judge on Tuesday set a tentative date for the capital murder trial of one of three defendants charged in the 2011 death of an elementary school teacher. Calhoun County Circuit Judge Brian Howell set May 20 for the trial of Nicholas Smith — accused of kidnapping and killing Wellborn Elementary teacher Kevin Thompson. 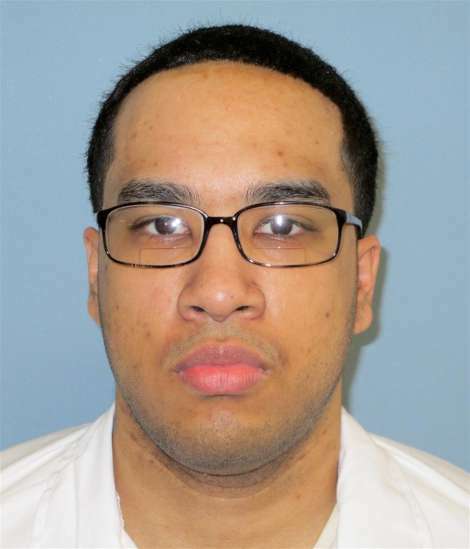 Smith, 22, who was present during Tuesday’s hearing, is being held in the Calhoun County Jail. Smith and two other men, Tyrone Thompson, a childhood friend of Kevin Thompson, and Jovon Gaston, are alleged to have kidnapped Kevin Thompson from his Jacksonville apartment in April 2011. Authorities have said the three men forced Kevin Thompson to withdraw money from several banks and ATMs in Jacksonville. Later the suspects allegedly killed the third-grade teacher and left his body alongside U.S. 278 in Cherokee County. Police discovered the body nearly two days after Thompson was reported missing. Calhoun County District Attorney Brian McVeigh said in Howell’s courtroom that setting a trial date was first on his agenda. “Our main concern is the trial date so we can begin scheduling witnesses and let the family know,” McVeigh said addressing Howell. Shaun Quinlan, Smith’s court-appointed attorney, told the court he was still working to obtain Smith’s school and mental health records. Quinlan said Smith had most of his schooling in Calhoun County. However, Smith also attended schools in Hawaii and California, and those records might be harder to acquire, he said. Quinlan asked Howell to consider having the court pay for him to travel to both states to obtain the records. Quinlan also said he would be filing a motion to have his client’s IQ and mental competence evaluated. The U.S. Supreme Court in a 2002 case ruled that defendants with an IQ less than 70 may not be executed, as it would violate the Eighth Amendment ban on cruel and unusual punishment. Howell said Quinlan needs to review Smith’s school records before ordering either evaluation. “There needs to be a good-faith basis to have those tests,” Howell said. Quinlan noted Smith did not graduate high school. Howell said by phone Tuesday afternoon that he hopes to have the school records by the end of the month. Howell said trials for the other men charged would start when the judges handling those cases were ready. Howell said even though the charges all stem from one death, the cases will be tried separately. “(Capital murder cases) are tough to try jointly,” Howell said. The judge said such cases are usually tried separately to avoid defendants accusing one another during the trial and to discourage the jury from convicting the suspects based on those accusations. State records show Circuit Judge Bud Turner will preside over the trial for Gaston. Circuit Judge Debra Jones will oversee the case against Tyrone Thompson. Attempts to reach Turner and Jones on Tuesday were unsuccessful. Howell scheduled another status hearing for March 18 to make sure all questions and issues have been addressed before the trial begins. A circuit judge said Thursday he is inclined to proceed with a capital murder trial in connection with the 2011 death of a Wellborn Elementary School teacher. Shaun Quinlan, the attorney appointed to represent Nicholas Smith after Smith was charged with murder, told Calhoun County Circuit Judge Brian Howell during a hearing that his �ability to work is not 100 percent,� after he broke his hip in a March accident. Quinlan told the judge he�s only worked half-days since he had surgery and plans to file a motion to continue the trial. Nicholas Smith, 23, is one of three men charged with kidnapping and murdering teacher Kevin Thompson in April 2011. Tyrone Thompson, a childhood friend of Kevin Thompson, and Jovon Gaston, are also alleged to have kidnapped Kevin Thompson and forced him to withdraw money from several banks and ATMs in Jacksonville. The third-grade teacher�s body was discovered by police on U.S. 278 in Cherokee County nearly two days after he was reported missing. Smith, who was present during the hearing, is being held in Calhoun County Jail. Calhoun County District Attorney Brian McVeigh said he believes Quinlan is �having a hard time� after his accident, but the DA said he has other capital murder cases scheduled and would rather not reschedule this trial. Howell said he would review the motion, but preferred not to change the trial date. �If at all possible I do not want to continue this case,� Howell said. The judge suggested Quinlan find a third attorney to work with him on the case. Quinlan said he was still missing Smith�s mental health, school and social history records from California, Hawaii, Georgia and Florida. Quinlan said the records, particularly those pertaining to mental health and social history, are important to his case. Howell said he would issue subpoenas in the next few days to ensure those records are obtained before the trial starts. The judge also ordered Smith�s mental health to be evaluated to confirm he�s mentally competent to stand trial. Janette Gagnon, a mitigation expert in charge of gathering Smith�s records, is travelling to California in May to meet with Smith�s father and other family members, Quinlan noted. McVeigh told the court he intended to file a written brief explaining why the trial should be held in Calhoun County, even though a change of venue request was never filed. McVeigh said he wanted to have something on the record, since it�s believed the murder occurred in Cherokee County. Quinlan agreed to the brief and said he would meet with the DA to discuss if a change of venue was necessary. Howell scheduled another status hearing for April 30 to meet with Gagnon and discuss other questions or issues before the trial begins. Sixty-two potential jurors filled out questionnaires this morning in preparation for next week�s capital murder trial of a man charged with kidnapping and killing a Wellborn teacher in 2011. Circuit Judge Brian Howell, who is overseeing the trial of Nicholas Smith, said the questionnaires will be reviewed by the prosecution and the defense before Monday. Answers potential jurors submitted on the 11-page, 96-question form are confidential and cannot be disclosed without court approval. Smith, 24, is one of three men charged with kidnapping and murdering Wellborn Elementary School third-grade teacher Kevin Thompson, 29, of Jacksonville in April 2011. Tyrone Thompson, a childhood friend of Kevin Thompson, and Jovon Gaston, are also charged with kidnapping Kevin Thompson and forcing him to withdraw money from several banks and ATMs in Jacksonville. The teacher�s body was discovered by police on U.S. 278 in Cherokee County nearly two days after he was reported missing. The questionnaire asks prospective jurors� criminal history, newspaper, television and radio preferences, and whether they are opposed to or in favor of the death penalty. Howell said the questionnaire serves as a way to make the selection process more efficient. �It saves us a lot of time. So we don�t spend three or four days selecting a jury,� he said. The judge said his goal is to have 60 jurors to select from Monday and he�s happy to be right on target. Howell said 117 people came to the Calhoun County Courthouse on this morning, but only 62 surveys were completed. The other 55 possible jurors asked to be excused for medical reasons, vacations plans and work-related issues, Howell said. On Monday, 12 jurors and two alternates will be selected for the trial. Howell expects to hear opening statements from attorneys Tuesday morning. Fourteen people were selected as jurors Monday evening for the capital murder trial that will begin this morning for the man accused of killing a Wellborn elementary school teacher. Five men and nine women make up the jury and 12 of those individuals will decide the fate of Nicholas Smith. Tyrone Thompson, a childhood friend of Kevin Thompson, and Jovon Gaston, are also charged with kidnapping Kevin Thompson and forcing him to withdraw money from several banks and ATMs in Jacksonville. The men are charged with stabbing the teacher to death and discarding his body along the highway. Thompson’s body was discovered by police on U.S. 278 in Cherokee County nearly two days after he was reported missing. During questioning by prosecutor District Attorney Brian McVeigh, the potential jurors were told that in order to serve on a capital case they needed to be willing to choose either the death penalty or life in prison without possibility of parole if the suspect were found guilty. Several potential jurors were excused because they stated they believed only one of those punishments should apply in this case, some saying death, some saying life in prison. Another juror was let go because that person knew Kevin Thompson, while one was able to leave for medical reasons. Calhoun County Circuit Judge Brian Howell told the jury the trial will begin this morning at 9. Jurors, who are not being sequestered, were instructed not to talk about the case with anyone and told the trial could last three weeks. Defense attorneys declined to present any witnesses or testimony today during the capital murder trial of Nicholas Smith, one of three men accused of killing Kevin Thompson in April 2011. Prosecutors presented their final six witnesses today on the fifth day of testimony in the case. Circuit Judge Brian Howell told jurors they will hear closing arguments Tuesday morning from Calhoun County District Attorney Brian McVeigh and Assistant DA Lynn Hammond and Smith’s defense attorneys Shaun Quinlan, Tim Burgess and Will Clay. Howell told the jury Monday afternoon to prepare for a long day of deliberation Tuesday. Smith, 24, is accused of stabbing Kevin Thompson to death. Thompson’s body was discovered in the early morning hours of April 23, 2011, behind a guardrail on U.S. 278 in Cherokee County. Prosecutors say Smith and two other men, Tyrone Thompson and Jovon Gaston, robbed the 29-year-old of $400 at gunpoint before they cut his throat and stabbed him multiple times in the chest. Carl Mauterer, an evidence examiner for the Alabama Department of Forensic Sciences, told jurors this morning he was able to match Kevin Thompson’s DNA samples taken during an autopsy to blood found on a pair of jeans, a steak knife and a pair of Nike sneakers. The evidence Mauterer tested was collected by investigators from a house owned by Smith’s friend, Whitney Ledlow, one day before Kevin Thompson’s body was found. The knife and shoes were discovered in a garbage can outside Ledlow’s house and the jeans were found inside the home, previous testimony noted. Mauterer told jurors that DNA tested from inside the sneaker matched Smith’s DNA profile, which was taken during an interview conducted by Anniston police officers. Andrea Mehltretter, a forensic examiner and chemist for the Federal Bureau of Investigation, testified today that she examined several pieces of duct tape collected from Thompson’s wrist, neck and at the scene where his body was found. Mehltretter compared those pieces of duct tape to a used roll of tape found in Ledlow’s garbage can. The forensic examiner told jurors that the tape on Thompson’s body came from the same roll of discarded tape. After prosecutors concluded their witness testimony this afternoon, Howell told McVeigh that the state had satisfied its burden of proof and the judge would deny any motions for acquittal. Closing arguments are set to begin at 9 a.m. Tuesday in Howell’s courtroom. Frances Curry, the mother of Kevin Thompson, sobbed and hugged her daughter and pastor after 12 jurors found Nicholas Smith guilty this morning of murdering her 29-year-old son in April 2011. The jurors deliberated for half an hour before reaching their verdict. Smith, 24, was found guilty of committing an intentional murder during a kidnapping in the first degree and committing an intentional murder during a robbery in the first degree. During his closing argument, Calhoun County District Attorney Brian McVeigh showed jurors a framed photo of Kevin Thompson and said: �This was the way his momma raised him, the way everybody knew him.� Then he showed photos taken of Thompson�s body after he was stabbed to death. �This is Kevin Thompson after he spent about six hours with Nick Smith. Think about that as you make your decision,� McVeigh said. Smith, Tyrone Thompson and Jovon Gaston were charged with kidnapping Kevin Thompson on April 20, 2011, driving him to several ATMs in Jacksonville and Anniston, robbing him at gunpoint of $400 and stabbing him to death. Jurors on Wednesday watched a taped interview of Smith talking to police in which he confessed to cutting the Wellborn Elementary School teacher�s throat. �He was with them every step of the way. From the time Kevin Thompson is removed from his house to the time Kevin Thompson is kicked down the hill,� he said. Will Clay, one of Smith�s three defense attorneys, asked the jurors to remember they were judging Smith on a small portion of his life. He also implored the jury to listen to the sentencing phase of the trial with an open mind. Clay said Smith listened to Tyrone Thompson when Smith was told to cut the third-grade teacher�s throat. Clay said during the next phase of the trial Smith�s lawyers would explain why. Lynn Hammond, assistant DA, told the jury that at any time during that night in April 2011, Smith could have opted out. �Why didn�t he drive to the Anniston Police Department? � Nick Smith could have yelled for help. He had choices. You don�t blame other people for your choices. You can�t blame Tyrone Thompson for your choices,� Hammond said to the jury this morning. Choking through her sobs after the verdict, Thompson�s mother said she was unable to comment. �It�s been emotional for her. You hope, but there�s always that in the back of your mind that this could go in the other direction,� said Michael Cox, Curry�s pastor at Cornerstone Church. Cox said church members have been in the courtroom throughout the trial to support the Curry family. �She�s a very tough lady. Her and Rena have been great examples for everybody,� Cox said, referring to Curry and her daughter, Rena Curry, Thompson�s sister. Penny Woodford, a fifth-grade teacher at Wellborn Elementary School, said she still sees the effect Thompson had on his students. �My prayer was for justice to be done and I think justice was done,� she said. Jurors will return to Circuit Judge Brian Howell�s courtroom on July 8 to begin the sentencing phase of the trial. Jurors will decide next week if Smith is given life in prison without the possibility of parole or the death penalty. The mother and sister of Kevin Thompson, a third-grade teacher killed in 2011, asked jurors today to give Nicholas Smith the death penalty. The two women’s testimony came in the sentencing phase of Smith’s capital murder trial. The jury on Tuesday found Smith, 24, guilty of committing an intentional murder during a kidnapping in the first degree and committing an intentional murder during a robbery in the first degree. The jury today listened to testimony from Thompson’s friends and family as well as Smith’s mother and aunt. “My bible says an eye for an eye. I know he’s had a terrible childhood, but I know he wasn’t thinking about his childhood when he took away my best friend, my brother,” Rena Curry, Thompson’s younger sister, said of Smith. Curry described the special relationship she had with her brother. “Not only was he my brother, but he was also my father figure,” she said. Frances Curry, Thompson’s mother, testified that she was the one who brought Tyrone Thompson into her family’s life. Prosecutors say Tyrone Thompson, Jovon Gaston and Smith kidnapped Kevin Thompson on April 20, 2011, drove the Wellborn Elementary School teacher to several ATMs in Jacksonville and Anniston, robbing him at gunpoint of $400 and stabbing him to death. Frances Curry said her 29-year-old son was hoping to give Tyrone Thompson good advice that might have helped him “get on the right track.” Shortly before Kevin Thompson was killed, his mother testified, he said he wasn’t sure Tyrone Thompson wanted to change. “Kevin said, ‘If he doesn’t take the advice this time I’m going to let him go.’ It was just one time too late,” she said as she began to sob uncontrollably. Testimony presented by the defense will continue Tuesday at 9 a.m. in Judge Brian Howell’s courtroom. A jury is deliberating whether to recommend the death penalty for a capital murder suspect in Calhoun County. Nicholas Smith is charged with capital murder in the death of Wellborn Elementary School teacher Kevin Thompson. He is the first of three people to go on trial for the crime. In closing arguments Tuesday, the Calhoun County District Attorney asked the jury to consider that Thompson was stabbed and his throat was cut. Defense attorneys asked jurors to consider Smith's childhood, which included physical and sexual abuse. The jury will resume deliberations Wednesday at 9 a.m.
A jury recommends the death penalty for a man convicted of killing a Calhoun County school teacher. It took the jury less than three hours to recommend that sentence for suspect Nicholas Smith. Smith admitted in a statement to police he cut Kevin Thompson's throat and stabbed him to death, but claimed someone else made him do it. Defense attorneys had hoped for a life sentence without parole, describing Smith as a "kid who never had a chance." "I believe it was a correct verdict, but these should not be easy decisions to make. It obviously wasn't an easy decision to make, but I still think they did the right thing," Calhoun County DA Brian McVeigh said. Smith will be sentenced in September and the judge is not bound by the jury's recommendation. Two other suspects in the case are set to go to trial sometime next year. Thanks for keeping us posted. This particular crime happened in my small hometown and affected many folks here. In this instance I do believe the jury has made the correct recommendation and I hope the Judge will adhere to their recommendation. Vote was 11-1 btw.